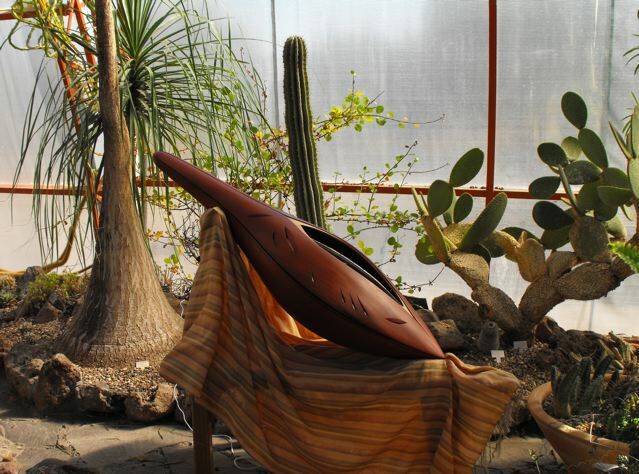 When I first wandered into the The Conservatory of Mexican Plants at El Charco del Ingenio, an impressive botanical garden in San Miguel de Allende, Mexico, I was met not only by a vast panoply of cacti and other succulents native to the Sierra Madre, but by music as well. The soft, melodic, haunting sounds appeared to be emanating from a sitar. Drawn towards the source of the sound, I discovered a sensuous wooden, handcrafted lute. But no one was playing. Plants were. To be more specific, a small cacti within a 20 inch terracotta pot. 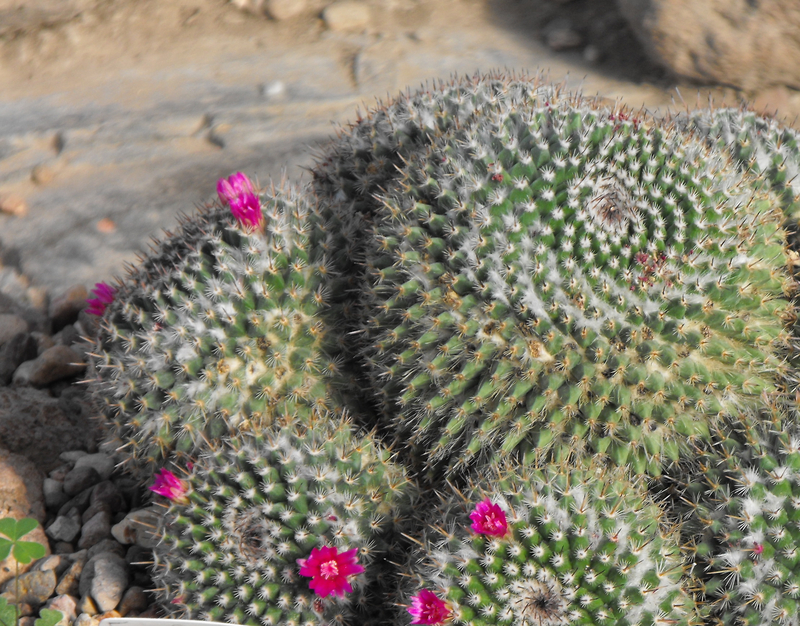 To be even more specific, these were cucumber-sized Echinocereus pentalophus forming a circle around a spiky barrel shaped Echinocactus platyacanthus. Looking back towards the lute and perplexed by the lack of any visible movement on the strings, my eye was led to three yellow, blue and green wires buried into the gray rocky soil and also connected to the lute reclining on a stand covered with a small striped, peach-colored cotton fabric. An electric wire was connected to a small solar powered panel outdoors. In his piece, Ariel Guzik, the founder of the Laboratory for Research in Resonance and Expression of Nature, features the central “performer” plant connected through a network of roots to electrodes inserted like acupuncture needles. The smaller surrounding cacti play a role as emitters to the lute. What I couldn’t see was the amplifier under the fabric. Guzik’s mission is to create “an empathetic language, universal and direct, between human beings and their environment …to wake up in the collective consciousness a profound emotional understanding of nature.” The effect of the subtle sounds conveyed was certainly haunting. In his title, “Music for Plants” one might notice the term “for” and not “from” plants. Intrigued, I suddenly recalled my first experience upon hearing dolphins and whales communicating in recordings by Paul Winter back in the 1970’s. Here, in the Conservatory, we are also being asked to consider that plants might communicate through sound. Guzik calls the surrounding ones in the Conservatory “ambassadors.” Hmm… where do I fit in? I pondered. Asking the opinion of a few others mammals such as an Englishman that had strolled in, he responded: “you have to see it to believe it.” And hear it. A friend used the word, “other worldly.” Others, such as two neurobiologists approached this phenomenon from a somewhat more skeptical angle. As one of them, Alison Fleming, Ph.D. and Professor of Psychology and Research Chair in Neurobiology at the University of Toronto suggested: “It is not clear that the vibrations, clearly produced by electrochemical changes in the root systems, could generate enough energy to move the strings of the lute. It would be in any case impressive if the lute were indeed being used as a ‘speaker.’ It is all very mysterious and maybe it doesn’t have to be. I would much prefer knowing what is actually going on than thinking it magic,” she said with her sparkling, inquisitive eyes. As a professor who shares with her students how science reveals nature’s marvels, she felt learning more how the string vibrations create the music would add not detract but would add to our experience. And so, where is the line between art and science? Does it matter? It did to me. To learn more, I returned to interview Martita Garcia, the Curator of Mexican Succulent Plants at El Charco (“small pool” in Spanish). Shedding a ray of light on the subject, she explained that indeed an amplifier rests below the lute thereby enabling vibrations within the instrument. What kind of symphony might occur if a larger group, say a chorus of plants, were all plugged in? On a smaller scale, she confirmed that different plants emit different patterns. Times of day matter too. If I understood correctly in my somewhat limited Spanish — not to mention scientific knowledge — louder and higher pitched sounds occur at night due to photosynthesis. Having absorbed and accumulated energy during the day, the plants convey more electromagnetic energy at night. Who would have thought? And where is the role of circadian rhythms? The biggest eye-opener however, occurred when Martha Garcia pointed out a few independent plants in the “audience.” Over the course of several weeks she had observed that a couple of these succulents were displaying visible physical changes. For example, one cactus had begun producing small pink flowers. Nothing strange here. It’s just that they had blossomed in the summer and were now re-blossoming, an unusual phenomenon at this time of year. From here, I began to dig a little deeper. I discovered ongoing research on “plant perception” and “bio-communication.” For over a century, scientists and laypeople have been making experiments on how plants, on some level, may be sentient creatures despite their lack of a nervous system and a brain. In the early part of the 20th century, a Bengali polymath, Chandra Bose, pioneered the study of remote wireless signaling. Also fascinated by plant physiology, he invented a “crescograph” (later perfected at Stanford University), that could show how various stimuli produce responses in plants — at times even expressed in visible physical changes. Of course, a number of writers, artists and filmmakers have also been captivated by the mysteries of nature and “self-expression.” For example, Roald Dahl’s short story, “The Sound Machine,” deals with a scientist who develops a machine enabling one to hear the auditory expression of plants. Focusing on how plants “experience” pain, the device relayed the scream of roses being cut or the heart-breaking moan of a tree being felled. Finally, I was reminded of The Secret Life of Plants by Peter Tompkins and Christopher Bird. In addition, a documentary came out by the same name with the soundtrack, Journey through the Secret Life of Plants by Stevie Wonder. With time-lapse photography we could see flowers opening, mushrooms expanding and vines twining. Today, we have Ariel Guzik further inviting us into this vast world that explores the physical, emotional, and spiritual relations between plants and other plants, and, by extension, plants and animals such as humans. laúd plasmaht Ariel Guzik from Ariel Guzik on Vimeo. This entry was posted in artscience, Mexico, natureculture and tagged Ariel Guzik, art, cacti. Bookmark the permalink. Thanks for this fascinating post. I can’t wait to visit El Charco’s Conservatory of (Performing) Mexican Plants! Glad you found it of interest and will want to see what’s happening at El Charco. Thanks for the post! …Thankyou soooo much! I want to know more and hear more and understand- What reading, c.d’s would you recommend?